As part of our annual fundraising initiatives, UBC together with the Pied Pipers are joining forces at the MCG . 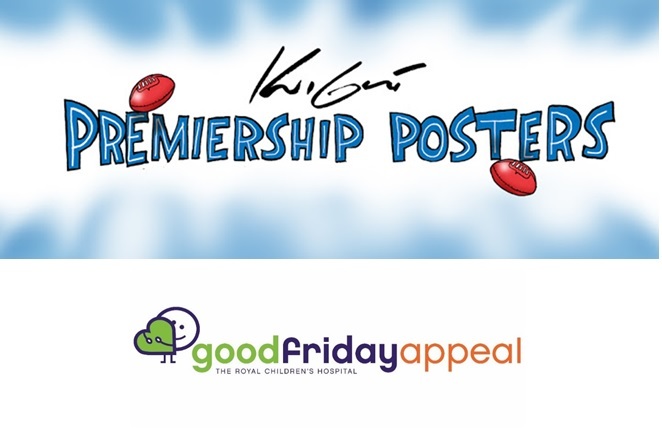 We are selling the AFL 2017 Premier Posters created by the extraordinary talented cartoonist Mark Knight from the Herald Sun. This fundraiser will take place over two days. With all proceeds donated to the Royal Children’s Hospital Good Friday Appeal, it is a fabulous day for you to Make Your Mark! and contribute to this wonderful cause. Join us and let’s make it the most successful fundraising event to date. Further details will be emailed to volunteers closer to the date. Family Day volunteers may need to attend at the MCG or an alternative home ground if an interstate team wins. There will be no volunteer/public parking supplied in Yarra Park on Grand Final Day. We highly recommend volunteers arrive by public transport or alternatively car pool or share parking costs.